Jared Unzipped: How To Survive A Bear Attack. I genuinely admire bears. They're smart, full of personality and eerily similar to humans in their behavior. And yet, they can also be savage killers if provoked. Almost exclusively, a bear attack is solely the fault of the human victim. We may tread upon its territory, or unknowingly approach their offspring. If a bear decides to attack a human, then it has a good reason. You are at fault. Now, let's say you do find yourself involved in a potential bear attack. Whether consciously or unconsciously, you've done something to piss the bear off. The only question now is... how do you survive? Here are some tips to follow if you're ever facing down a bear. The strongest piece of advice I can give is to avoid putting yourself in danger to begin with. Don't move through a bear's habitat in solitary silence. Travel through forests with a friend and make a normal amount of noise. Bears will actively avoid you in return, so let them know you're coming. 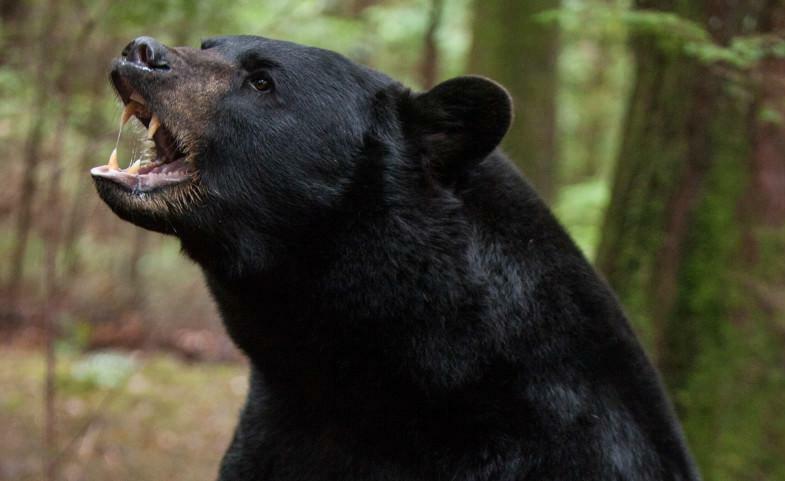 Are you dealing with a black bear or something more menacing like a grizzly? This info matters! Grizzlies have a lump on their shoulders; black bears do not. The black bear has tall ears, whereas the grizzly has short ears. The face of a grizzly is also more broad and has a dished profile. Finally, the grizzly has much larger claws than a black bear. This knowledge becomes important later on. If you see a bear before it sees you, either return the way you came or walk the LONG way around. Give the bear plenty of space. Whatever you do, NEVER RUN FROM A BEAR. This triggers its aggressive instinct to chase and attack. If you do find yourself in close quarters with a bear, stay calm. Speak in a soft, but direct voice. Say something with a steady, even tone like "Time to go away, bear." If you can back away slowly while speaking, do so. More often than not, a black bear will attempt to flee from you. Give it plenty of room to do so. Do not limit its avenues of escape. If you happen upon a grizzly, the same rules apply, but don't try to move it away as with a black bear. Just back away slowly and speak in a reassuring, pleasant voice. If you surprise a bear and it becomes aggressive, this is its way of trying to deter you. Naturally speaking, bears don't want to fight any more than you do. A black bear will only present aggressive behavior (growling, swatting, snapping jaws) if you are near her cub, too close to a food source, or simply sneak up on him/her by mistake. Again, back away slowly while speaking in a calm voice. There is only one instance where you should "play dead" in a bear attack. 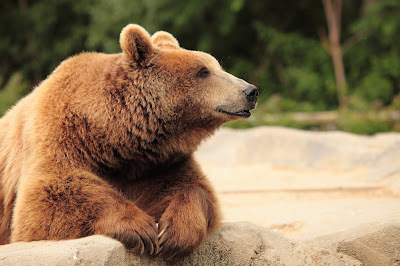 If you are in close physical contact with a grizzly bear, roll onto your stomach on the ground, put your hands over the back of your neck and head, then spread your legs and elbows wide. Your chances of surviving a battle with a grizzly improve if you do this. The grizzly will probably lose interest after a bit, but stay still! Do not get up (if you can) until you're certain the bear has gone away from the area. But what if the grizzly bear starts to eat you? If a grizzly (or extremely rarely a black bear) has decided to make you lunch, even after playing dead, you're in a heap of trouble. Now is the time to make a lot of noise and fight! Shout, wave your arms around and act as big as possible. Make eye contact with the bear. Punch it in the face, eyes and nose when it starts to attack. Do whatever you can to inflict as much damage to the bear's face as possible. You're undoubtedly going to be injured, so don't be afraid to lose a hand or limb if you have to. Better to live life with one arm than be dead. You're not going to be able to outrun a bear, so this is your last and best option. If the bear decides that you're too much trouble to fight, they'll back off. Or, they won't... in which case, sorry about your luck pal! I really love bears, but they need their space in the wild. Respect the bear and its habitat and they'll respect you in turn. Just remember... if you see a bear, back away slowly, speak in a calm voice and relax. The bear wants to live to see another day, just like you.